Digi Template Switch Pro can override the default Joomla template with another one, only for mobile browsing. Unlike the free version of this plugin, the pro version offers a lot of possibilities to switch a Joomla template, for example you can select a template for smartphones and another one for tablets, you can choose to switch the Joomla template only for a mobile operating system (iOS, Android, Windows Phone) or only for a browser (Internet Explorer, FireFox, Chrome, Safari, Opera), you can choose to switch to specific templates in the homepage or specific templates in sub pages. If needed you can use custom filters, where by adding tags and creating combinations of those, you can change the template for a specific page, for a specific operating system, for smartphone or tablet. This plugin includes a convenient backup feature to save the current configuration, and reload it if and when it is required. 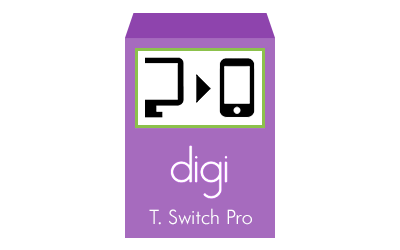 To install Digi Template Switch Pro, go to under Joomla! extensions manager, choose to upload a package file and select Digi Template Switch Pro package file (plg_digi_template_switch_pro.zip). After installation you must activate the plugin. You can find it in Joomla plugins manager. No, this plugin works just on frontend, so you can login to your admin with the default admin template also from mobile devices. Can I switch two different templates, one for smartphones and one for tablets? Yes, you can select two different templates, one used by smartphones and one used by tablets. Can I select on which pages the template will switch? Yes, you can select two templates for the homepage (one for smartphones and one for tablets), and two other templates for sub pages. Can I select on which operating system the template will switch? Yes, you can select on which operating system the template should switch (iOS, Android, Windows Phone). Can I select on which browser the template will switch? Yes, you can select on which browser the template should switch (Internet Explorer, FireFox, Chrome, Safari, Opera). System name changed from "plg_digi_template_switch_pro" to "digi_template_switch_pro"
The best way to switch between two Joomla! templates one desktop and one mobile. Functionality: It does what it has to do. I have selected my mobile template from the list in the plugin, and now I see the new template by my smartphone. Ease of use: Very easy, because by options you can setup all and have a dedicated template for iPhone and another for Android. Support: I ask for a question because I wanted to use custom filters, and the developer gives me the answer in a short time. Documentation: The plugin is well explained on its page, on the developer website. Value for money: I have bought this paid version now. I had the free version, it worked perfectly but I needed more options. This version is perfect! I used this to: I use on Joomla 3 to switch templates from smartphone and tablet, choosing also the operating system, if iOS or Android, to show to users the right template as I want.